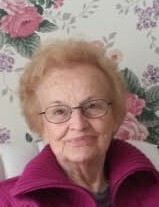 Obituary for Arlene D. Pellegrino | Cyril F. Mullins Funeral Home Inc.
Arlene D. Pellegrino, age 88, of Shelton, peacefully passed away August 16, 2018 at Hewitt Memorial Health and Rehab surrounded by her loving family. She was born in Fairfield, CT, daughter of the late John and Ann Dobrich. Mrs. Pellegrino lived in Trumbull most of her adult life. She retired as a supervisor at the Trumbull Library at 72, having been able to share the joy of books and love of learning she had previously instilled in her children with so many others throughout the community. In her earlier life, Mrs. Pellegrino had been a member of the Catholic Women’s League in California and in New Hampshire, and thoroughly enjoyed a rousing, competitive game of bridge. She also enjoyed the company of her cats who followed her everywhere, always anticipating treats. An avid gardener, Mrs. Pellegrino’s dislikes included invasive weeds and hungry deer. Her joy at the approach of spring was exceeded only by her diligence at maintaining her garden and her delight at nurturing new plantings. Mrs. Pellegrino was a worldwide traveler with many experiences including cruising through the English countryside in the back of a new Rolls Royce, riding a camel by the Great Pyramid of Giza, exploring the Vatican, and visiting the tomb of Jesus at the Church of the Holy Sepulchre in Jerusalem. Her favorite may well have been the seacoast of southern Maine, to which she returned with family each summer. She was above all else a family woman, holding her children close after the premature death of her husband and leading them into adulthood. The highlight of her life was her grandchild, who she spoiled with endless love and affection that was repaid in deep devotion. She was predeceased by her beloved husband Anthony Pellegrino. She is survived by her children John (Karlene) Pellegrino of Wilton, Susan (Andrew) Mais of Wilton, and Lynn Pellegrino of Shelton; one brother Robert (Anne) Dobrich of Vancouver, WA; one sister Helen Nielsen of Ivoryton; cherished granddaughter Jennifer Nicole Mais of Stamford; and numerous nieces and nephews. Friends and family are invited to attend her funeral services on Tuesday, August 21st at 11 a.m. at the Cyril F. Mullins Funeral Home, 399 White Plains Rd. Trumbull. Interment in St. Michael's Cemetery, Stratford. Friends may call on Monday from 4-8 p.m. In lieu of flowers, memorial contributions may be made to The Kennedy Center, 2440 Reservoir Avenue, Trumbull, Connecticut 06611.